Most executives are busy people. They are often seen running (literally) from meeting to meeting. Those meetings are typically scheduled by an equally busy and often super savvy assistant who knows who to make time for and how urgent the meeting is. One of my former bosses used to say, there is no such thing as a one-minute meeting. He was right. Meetings require preparation, participation and usually follow-up, the good scheduler blocks time on the calendar for all three. Recently, I had the opportunity to try an AI assistant called Amy Ingram. There was a lot of back and forth with Amy before the meeting was scheduled and a location was determined. So, Amy got the job done and I am sure that as she learns, her results will improve. The truth is that the Executive Assistant (EA) is someone who anticipates the boss’ needs and priorities. Making a decision to book a meeting is complex. The exceptional EA, knows the right questions to ask and is a master at managing the boss’ time – just ask a cold-calling salesperson! If you have an EA who makes scheduling decisions for you be sure to let that person know your preferences. For example, if you need to pick your child up at the day care no later than 6PM, scheduling a 5:30 meeting in your office is not possible. I use colour coding in my own calendar to indicate meetings that cannot be moved or changed. What is the purpose of the meeting? e. to update, share information, get information, ask for agreement/decision, or guidance/coaching. How many people are involved? i.e. one-to-one; group and who are they? (names) and what are their roles in the meeting? When a meeting is booked on the calendar make sure: there is time before the meeting to reach the destination and prepare; the agenda and participants’ names are in the booking; the location, phone number or URL is on the calendar; there is time after the meeting to make notes and schedule and follow-ups. 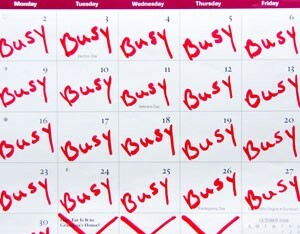 PS: If like me, your calendar is your life, be sure to block time for friends, family, workouts and fun. Your calendar can be your best friend or your worst enemy. The choice is yours.